Checkout 51 Reviews – Useful Tips and Tricks! Checkout 51 reviews: tips and tricks to more savings! 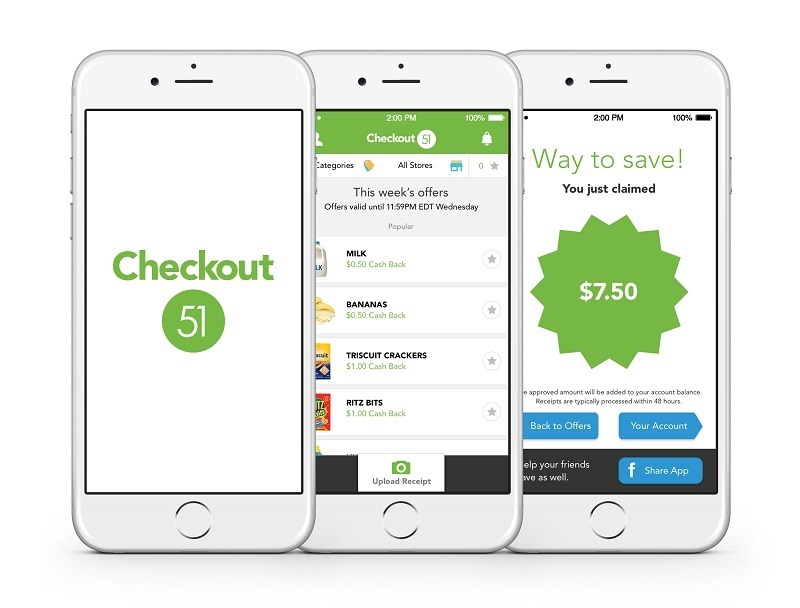 Checkout 51 is one of the best grocery rebate apps currently available. Use it to save on your groceries and daily provisions (cereal, dairies, drinks, produce) by snapping a picture of your receipt and earning cash backs for qualifying purchases. Can You Sell Games You Have Played Before? If you are like me, you probably have a bunch of games sitting in your Steam inventory collecting dust. Well, instead of leaving them to rot, how about learning how to make money selling steam games? Now, it’s important to note that not every Steam game in your inventory can be sold. You’ll have to check if your games fulfill certain criteria before listing them for sale. Before we dive into the best places and websites to sell Steam games, let’s look at which Steam games can you sell for money. Can You Sell Steam Games That You Have Played Before? Obviously, if you have redeemed a key and played a Steam game before, you can’t sell it. The game activation key is tied to your Steam account and it can’t be used again. However, if you have spare Steam keys or keys that were gifted by friends, you are in luck. Before listing any Steam key for sale, make sure that it is brand new and has not been redeemed by anyone before. If you activated the key and removed the game from your library, it is no longer valid and the buyer will not be able to use it. Steam gifts also have to be brand new. 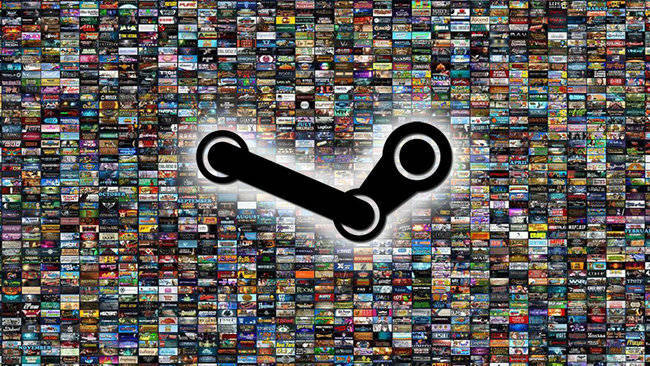 There are a lot of marketplaces out there to sell unused Steam game keys, but you want to find sites that secure your rights and have a large user base, so you can sell your Steam games away quickly. Currently, Steam doesn’t provide any official way of converting your unused games into cash, so your only alternative for selling Steam games is to look for third party websites. Out of so many site out there, I’d recommend only 3 of them because they feature a large buyer base and secure payment options. Don’t bother selling your unused Steam games on eBay or Craigslist. You will have to deal with the buyers, which sometimes turn out to be pesky scammers. If they claim fraud on your key months later and open a PayPal dispute, you are pretty much guaranteed to lose your money. The websites listed below have built-in protection for both the sellers and the buyers, so the chances of you encountering disputes is a lot lower. 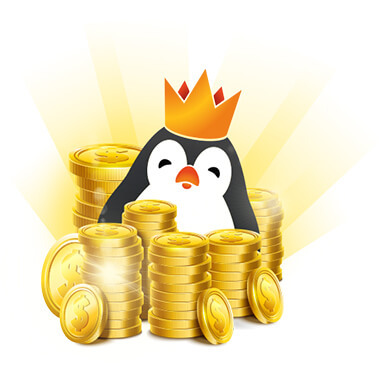 Kinguin.net is one of the long-standing and extremely popular P2P site when it comes to buying and selling games. Apart from Steam games, you can also sell games for various platforms, including Playstation and Xbox. It’s easy to register for a free account and start selling on Kinguin. 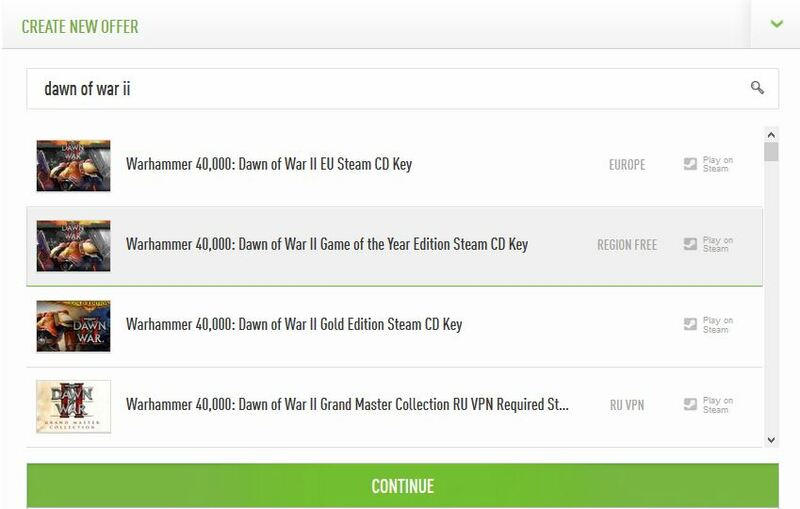 They provide a step-by-step instruction to make sure that you are selling valid game keys, so the chances of error is extremely low. Once you have registered for a free account, go to the seller’s page for Steam to create a new offer for your unused Steam game key. Simply type in the game name and a list of games released on Steam will appear. For example, I typed “Dawn of War II” and a whole list of Steam games containing the keywords appeared. Do note that digital games come in all shapes and sizes – there are often different versions available for the same game. Some may include additional content (e.g. extra DLCs), have specific requirements or different regional restrictions. You must select the correct version that corresponds to your Steam game key. You can choose to view your offer price in different major currencies. Once you have listed your game, name a price that you want to sell. It’s a good idea to check Kinguin’s marketplace to see what’s the average price for the title you are selling. If you are selling higher than the going rate, chances are you will be hard-pressed to find a buyer. Let’s say I want to sell my game at €20, and the system will automatically populate the price the buyer has to pay. It is slightly higher than the selling price because it includes handling fees and a small commission charged by Kinguin.net. I’d say the commission rate is reasonable when it’s compared across different major marketplaces for selling Steam games. The beauty of Kinguin marketplace is that once you select the correct game to list, the website displays all the product descriptions, screenshots and videos for the game. Kinguin even provides the recommended system specifications to make things easier for the buyers. You don’t have to worry about writing a compelling sales page or listing down all the correct details. Just select the correct game and name your price, and you’re good to go. PlayerAuctions.com is another major P2P trading marketplace for unused Steam keys, and they have been around since 1999. This speaks volume about their reputation. However, when it comes to user-friendliness, I still think Kinguin.net is way superior. The selling process for PlayerAuctions is a bit dated, and will require more input from you. Instead of typing the name of the game, you will need to find and select the game from a drop-down menu. If you can’t find it, you can select “others” and provide the name yourself. After that, you’ll have to add a photo and descriptions for the Steam key you are selling. One quick way is to grab the official game image from Steam and copy the description for the game. Do note that you are not allowed to include your personal information, including your email and contact number. All transactions have to be done via PlayerAuctions platform, and your listing can be taken down if you violate their rules. Next you’ll need to provide a “seller’s delivery guarantee period”. Basically, this is your promise to complete the delivery within a certain time frame after the buyer has sent payment to you via PlayerAuctions. If you fail to deliver the Steam game key to the buyer within the guaranteed time frame, the buyer can cancel the order and get a refund from PlayerAuctions. Since buyers are unable to contact you independently (PlayerAuctions doesn’t allow sellers to list their personal information), you will receive a notification from PlayerAuctions if a buyer pays for your Steam game key. You need to deliver the key to the buyer within your delivery guaranteed period, so choose a time frame that is reasonable for yourself. G2A.com is a huge marketplace, with millions of traffic coming to their site every single month. 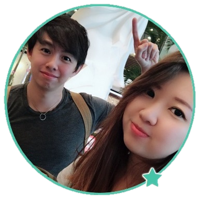 The listing and selling process is pretty similar to Kinguin.net, where they take care of most aspects for you and take a cut of commissions when the item is sold. First, search the game you want to list by typing the name (similar to Kinguin.net). All available listings will appear, select the description that matches your Steam game key. 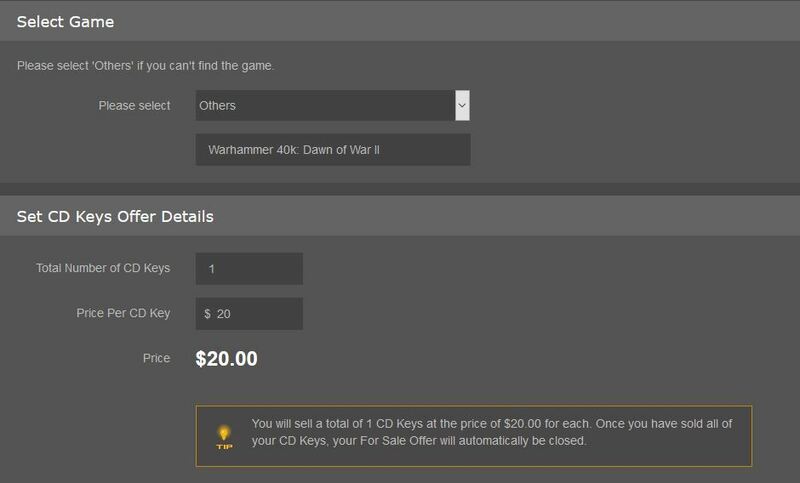 If your game key variant is not included in the list, you can create a custom offer by clicking the green text beside the text box. Name the price you want to sell your Steam game key at. G2A.com has a few tricks up their sleeves when it comes to selling your Steam games quickly. 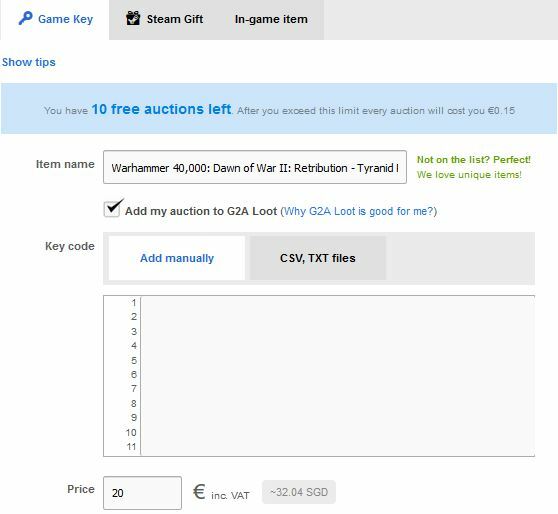 Firstly, you can choose to add your auction to “G2A Loot”, which is an additional marketplace to list your Steam key. This is a no-brainer as it gives your offer additional exposure at no costs. Secondly, you can choose to include your auction to “G2A selected offer”. Now, this is a bit tricky, as your offer has to be among the best-priced to be featured as a selected product. 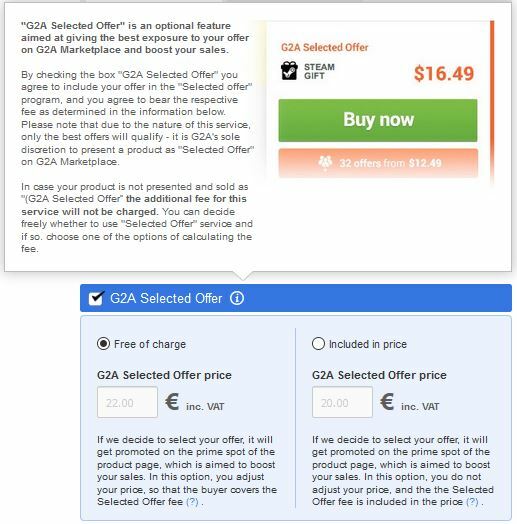 Apart from that, if your product is successfully sold through G2A selected offer, an additional charge will be levied upon your offer. However, you can choose to increase the product price slightly to offset the commissions (buyer will bear the cost), or you can keep the price and bear the extra costs yourself. 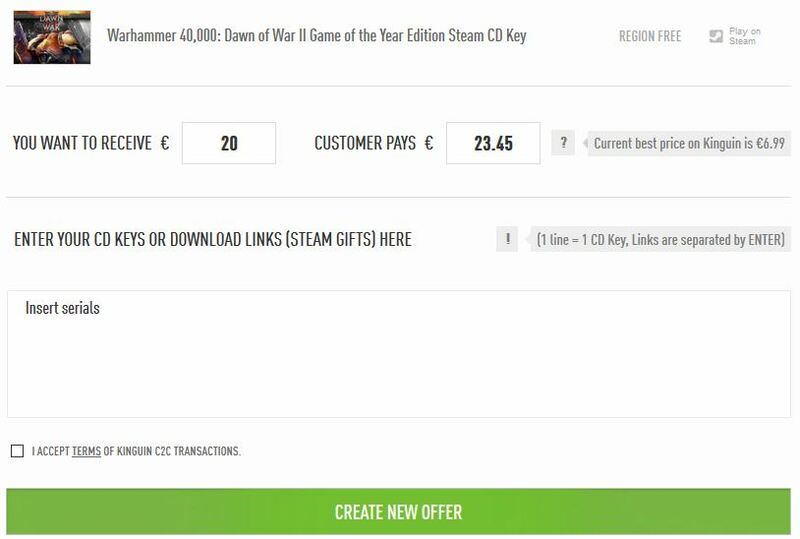 If you just want to sell your Steam game key as quickly as possible, listing your offer as G2A selected offer at an attractive price and bearing the extra charge can go a long way. Obviously, if you have a bunch of unused Steam keys and gifts, it’s impractical to list them on all 3 sites. In this case, I’d recommend that you list the games on either Kinguin.net or G2A.com as the selling process is streamlined and simple. You can also include multiple keys in a single listing. However, if you only have a handful of keys to sell, it’s a good idea to list them on all 3 sites to maximize exposure. Some sellers buy a bunch of Steam keys during the Great Steam Sales and sell them at a higher price afterwards. However, this will require a bit of entrepreneurial spirit, and the ability to predict market demand a few months down the road. Selling Steam games online may earn you a few bucks here and there, but it’s not a sustainable way to make money online. Of course, if you just want to clear your Steam inventory of unused keys and un-redeemed gifts, the websites above are perfect for that purpose. However, if you want to make consistent income from the internet, you will need to do much more than just selling Steam games. The recommendation below is not for everyone, but if you are interested to make a living from the internet, the article below may change your life forever. This is the same method that I use to generate a decent monthly income from the internet, and the best thing is I only work on it part-time. I still hold a day job, and it seems that my online income will surpass the full time income in 1 year’s time. One of my readers emailed and asked me to write a VO Genesis review, because she is genuinely interested in voice-over gigs but she’s unsure if VO Genesis is a legitimate program. On first glance, I’d say that VO Genesis is most likely a scam. It projects all the hypes and unrealistic expectations that an online scam usually does. But as I purchased the book and dug deeper, I realized that it actually provides pretty good value. So what can you really expect from VO Genesis? Let’s find out. What Can You Expect From VO Genesis? Should You Buy the Up-sells? OctoSuite Review – Which Upsells (OTOs) Are Worth Your Money? Welcome to my OctoSuite review page, you’ll find all the information you need here to maximize the potential of the software. OctoSuite is a social media manager software created by Luke Maguire to find viral content on Facebook, Twitter, Reddit and Youtube and post them as your own. This is a proven marketing strategy to drive quality traffic to your website or landing page, as these viral content are shared extensively and create a lot of user engagement. While OctoSuite is a great software, we have also seen multiple upsells (one-time offers) that follow the initial purchase. Naturally, some customers don’t like it and there are even rumors on IM forums that OctoSuite is a scam. OctoSuite is definitely not a scam, but it is also true that you don’t need all the upsells to succeed with the software. In this OctoSuite review, we look at each of the upsells in detail and decide which are truly important to make OctoSuite effective. Instamate 2.0 Review – Should You Buy the Upsells (OTOs)? Instamate 2.0 is currently unavailable. Another recommended tool that you can use to automate your Instagram business accounts is InstaQ software. Instamate 2.0 is an all-in-one software to manage your personal and business Instagram accounts, and frankly it has exceeded our expectation. While the software itself is great, we have also seen multiple upsells that follow the purchase. Do you really need all of them to succeed with Instamate? Not really, but some of them are important to make it truly effective. Naturally, as with many other digital products, there have been rumors on internet marketing forums that Instamate is a scam. While some people may be turned off by the up-sells that follow the initial software purchase, it isn’t necessarily a bad thing as it provides unique features that some people may want to pay for. Who Should Use Instamate 2.0? How to Use Instamate 2.0 Effectively?